David T. Smith takes a look at a way to enjoy the deliciousness of a Chocolate Orange without having to hit something with a hammer - Chocolate Orange Gin! In the 1930s, chocolatiers began to experiment with flavouring chocolate using flavour oils, incidentally often created by distillation. One of the early products created using this method was the chocolate orange, first sold in 1932. Previously, the same company had made a “dessert chocolate apple” (produced from 1926-1954); sadly, it was not apple-flavoured, just apple-shaped. Other flavoured chocolate joy-joys included a pineapple chocolate and the oh-so seventies chocolate lemon. The chocolate orange has now been a favourite for birthdays and Christmas presents for generations and, at the height of their popularity, one in ten Christmas stockings contained this sweet treat. 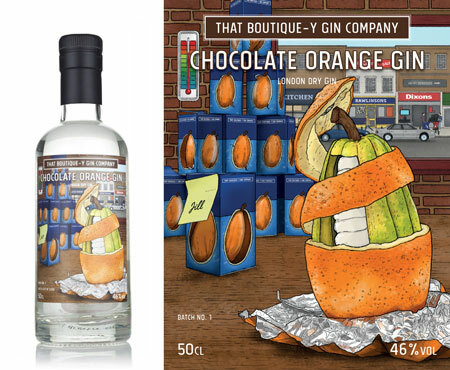 That Boutique-y Gin Company's Chocolate Orange Gin is flavoured completely via distillation (hence it is technically a “London Dry Gin”), with no flavourings being added afterwards. A selection of core gin botanicals make up the base of the botanical recipe, to which are added zesty bitter orange and rich cocoa nibs. The result is a slinky, creamy and decadent spirit. The label shows a cocoa nib covered in a gradually-unravelling orange peel. A display of boxed chocolate oranges sit on a table in the background, all of which seem to be slightly shop-soiled; no doubt they can be had for a song (or perhaps a cheeky plug for the retailer). One lucky, lucky lady called Jill seems to be the only person who will receive their confectionery in mint condition. However, if the temperature on the wall is to be believed, all of the chocolate oranges are in peril of melting and congealing to form an almost inedible, hardened cricket ball of chocolate when they are rechilled. Thankfully, TBGC Chocolate Orange Gin will not melt in your hand. Nose: A bright and enticing nose with dry cocoa and the zingy “zip” of orange. Fantastic! Taste: A thick and creamy spirit that perfectly creates the illusion of chocolate orange with notes of milk chocolate and zesty orange. Finish: Lingering citrus and a pinch of juniper and pepper. Fans of the spherical chocolatey treat will fall head-over-heels for this one. Add the chocolate buttons to the milk and stir. Heat in the microwave for two periods of 30 seconds each, stirring in between. Stir again once heated to ensure that all of the chocolate melts, before adding the gin. Leave to stand for a minute before stirring once more and then serving. Add all of the ingredients to cocktail shaker and shake thoroughly with ice, fine strain into a cocktail glass and garnish with crumbled flake or nutmeg. This is a variation on the Alexander cocktail from the early 20th century, which was traditionally gin-based, but was later modified to use brandy instead. This recipe uses both.